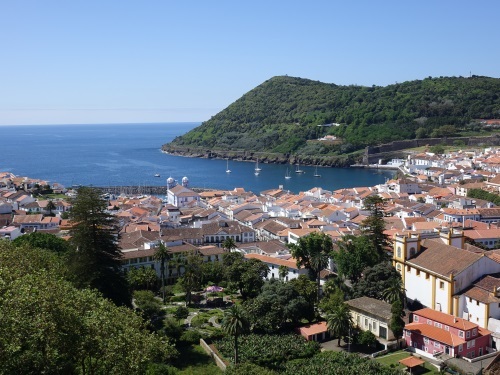 The "Central Zone of the Town of Angra do Heroismo in the Azores" has been shaped by its role as a port-of-call for ships between Europe and America from the 15th century onwards. Its principal buildings are the Sao Sebastiao and Sao Filipe fortresses, the Santissimo Salvador cathedral and the Franciscan and Jesuit convents. Angra do Heroismo is located on the island of Terceira. It is the oldest city on the Azores, possibly dating as early as 1450. Angra was hit by a major earthquake on 1 January 1980 that did considerable damage to the city's historic center. 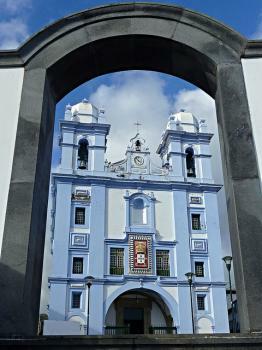 The Central Zone of the Town of Angra do Heroismo in the Azores was a relatively early WHS (1983). As no nomination files of that period have been made public and the ICOMOS evaluations at the time were concise, the ‘Why’ of the nomination and inscription isn’t well-documented. The only thing that stands out is that Angra was an important port-of-call during the maritime explorations of the 15th and 16th centuries. How this is linked to tangible elements in Angra itself is rather unclear. Maybe just ‘being there’ half-way between Europe, Equatorial Africa and the West Indies was enough. Angra is located on the island of Terceira, one of the 9 islands of the Azores. To get there I used the weekly direct flight by charter company TUI from Amsterdam to Terceira. My fellow passengers on the full flight were mostly Dutch senior citizens. The flight to Terceira airport took only 3 hours and 40 minutes, and afterwards I immediately hired a taxi to take me to Angra where I was to stay for 3 nights. My first impression of the town was that it seems colourful and festive (possibly related to the weeklong Sao Jao festival), and not overly touristy. It was still way too early to check-in to my hotel, so I decided to start with the 1.5 hour walking tour of the town center that is described in the Bradt travel guide. It connects several churches and other points of (low) interest such as an embroidery museum. Walking Angra’s streets is exhausting, as the town is plastered on to a hill with steep ascents. Among the town’s main features are its brightly painted buildings in various colours. It resembles the baroque towns of Brazil, but here in Angra it all seems brand new. And in a way it is – some 70% of the buildings in the historic center were demolished in a big earthquake in 1980. Since then they have all been reconstructed. Besides the pretty facades most of the buildings aren’t very spectacular on the inside (or aren’t accessible at all). The one that I enjoyed the most was the Convento de Sao Francisco, which now houses the City Museum. 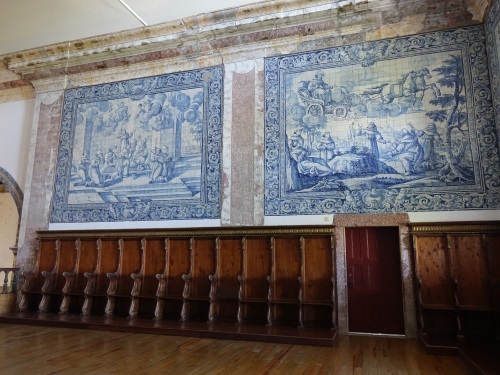 The convent’s church and the tableaux of azulejos on the second floor are just great. Another aspect not to miss is the walk through the Duke of Terceira’s Garden up to Memorial Hill – from there you will have the great views and photo opportunities of the bay of Angra and the remains of the two fortresses that once guarded it. I stayed overnight in the Posada de Sao Sebastiao, located in one of the two main fortresses around Angra harbour and thus an essential part of the WHS. It still looks impressive when you walk up there. It is a bit of an empty shell however. Directly behind the gate the modern hotel starts, which isn’t really worth the considerable sum they charge per night. One of the ‘issues’ with Angra is that it isn’t a real port anymore. Sure there is a small marina for private yachts, but the lively atmosphere of an active port is totally lacking. It was a safe harbour during the Age of Exploration, the island of Terceira being protected by dozens of fortresses. Many churches and a hospital were built to take care of the sailors passing by that were in need of a rest. Pirates hovered around to try to capture a booty. Ship wrecks and anchors still can be found in Angra’s former harbour. Nowadays there’s even an underwater archaeology park where divers can have a look at those. I visited this WHS in October 2015. At last I can give some information on this WHS from a non-native perspective and from someone who has not been posted to work there. Angra do Heroismo is situated 1566km away from Lisbon, in one the Azores archipelago in the Atlantic Ocean called Terceira. Terceira merely has 56,000 inhabitants, meaning that it has much more cattle than people! In Azores terms it is one of the most populated since it has a vast verdant fertile land suitable for agriculture. Angra is proudly described by locals as the window of the Atlantic between Europe and the New World as well as the Atlantic's first European city. To arrive in Terceira, I flew from Lisbon to Ponta Delgada, Sao Miguel Island and then to Terceira the following day. I spent 3 days in Angra (Anchorage) and I really enjoyed my time there. The taxi ride from the airport to Angra costs around 20 euros so I opted not to drive in Terceira mostly because it would be quite hard to find a suitable parking space. The best panoramic viewpoint is definitely opposite Monte Brasil just below the Monumento Alto da Memória (which really looks out of place and reminded me of the Golden Pagoda in Vientiane, Laos!). Before this monument was erected there was yet another fort/castle here. From this point I followed a clearly sign-posted UNESCO WHS trail covering 24 locations of interest. In a way it is the same approach adopted for Macao, China and indeed with the same type of information boards. It is easy to cover over a day but since the weather is quite unpredictable here and since the hike to Monte Brasil is quite uphill I would advise to allow at least 2 full days. There are 2 400 year old forts/castles guarding Angra - Sao Joao Baptista do Monte Brasil/Castle of Sao Filipe, which is situated in a military zone and which is only accessible escorted by a military guide at 14:00hrs every day, and the Fortress of Sao Sebastiao which nowadays houses a pousada but is still worth visiting if only for the walls and the view over Ilheus das Cabras. 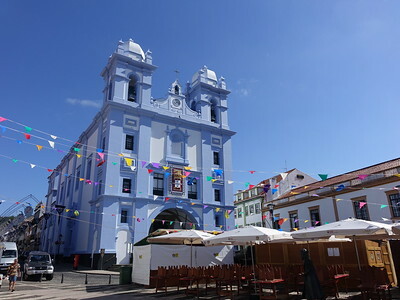 The other locations are mainly clustered along or around the 2 'landmarks' of Angra do Heroismo - the yellow coloured 2 steeple Santissimo Salvador da Se Church and the blue Misericordia Church (picture). Both are worth a short visit while strolling down Rua da Se and Rua Direita. I also hiked up to Monte Brasil and round the rim of an extinct volcano. The view over Angra is very worthwhile especially on a sunny day as you can easily spot the Renaissance influence on the city. Overall, the restoration works are of excellent quality even though the new marina hotel built opposite the Fortress of Sao Sebastiao really is a depressing eyesore to behold. The highlight of my visit though was the hidden Sao Goncalo Church inside the Convent of Sao Goncalo. Although the convent doors are always closed, you can ring a bell at the side entrance of the convent and by paying 2 euros you will be shown round the church and the convent. The oval baroque presbytery is really unique as are the old azulejo tiles that adorn the church. This WHS is definitely one of Portugal's best cultural WHS even though its geographical position was instrumental for inscription early on in the list. 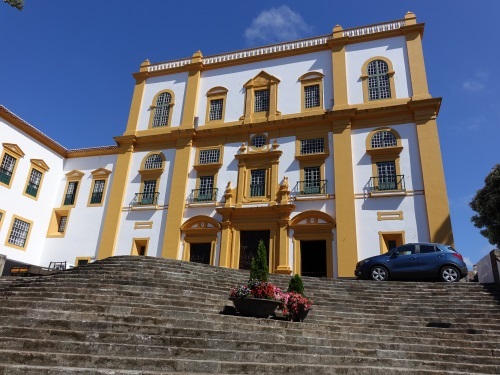 While in Terceira, try not to miss the tentative site of Algar do Carvao which is quite unique even though I think it won't be inscribed any time soon and also visit some of the colourful chapels dedicated to the Holy Ghost as they are really worth visiting. I worked on the island of Terceria for 2years (2000 - 2002) I had a solo photo exhibit sponsored by the island Ministry of Culture,and held in the 150yr old theatre in the centre of the city. I particularly enjoyed walking the steep streets early on Sunday morning, with little or no traffic noise. Plenty of friendly coffee places and genuinely friendly people The view from the top of the Angra Gardens is well worth the effort to get up there.Spectacular views from the top of Monte Brasil give an idea of this being the last stop for many Portuguese Discoverers before setting sail into the Atlantic. Well worth the effort to get there! I had the great experience of being stationed on the island of Terceira with the US Air Force March 1958 thru November 1959. I visited the City of Angra on numerous occassions during that time and took hundreds of color photos, of this beautiful City and its people. The city park, the cathedral, the city square and harbor, all provided many hours of interesting exploration and the subjects of great pictures that I enjoy viewing to this day. 40 Community Members have visited.